I rarely write review about whitening product, literally not a fan of fairness product, but sometime it's really useful when you have some dark spots on the face. 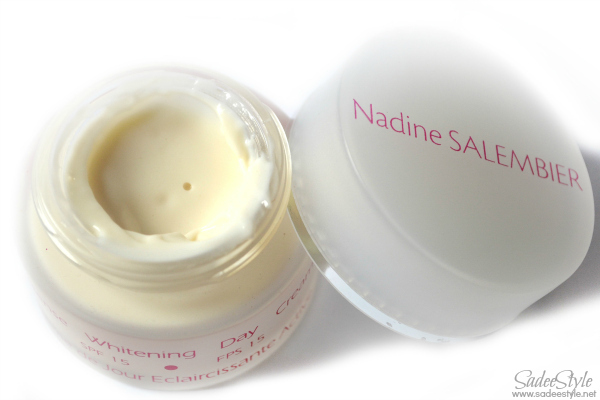 Well today I got a chance to write a review for Nadine Salembier which is probably a new brand for me. It's basically a Belgium brand and comes with three products whitening cleansing milk, hydra repair whitening night fluid and whitening day cream. I will start with the cleansing milk. This product claim to cleanse away of all impurities, without aggressing the epidermisand maintains the natural Ph of the skin, leaving the pores tightened and a feeling of comfort is returned. Apply a small amount a cotton wool pad and remove your eye makeup. Rinse off with warm water. Pour a small amount into the palm of your hands and gently massage face and neckline in circular movements, rinsing off with warm water. Dry the skin thoroughly then apply the Whitening and Tightening Lotion . The second product i got is called Hydra Repair Whitening Night Fluid which claim to light & refreshing fluid regenerates and lightens the epidermis at night, eliminating pigmentation marks and leaving you with a soft and luminous complexion in the morning. To be applied at night on a perfectly clean skin, penetrates rapidly. 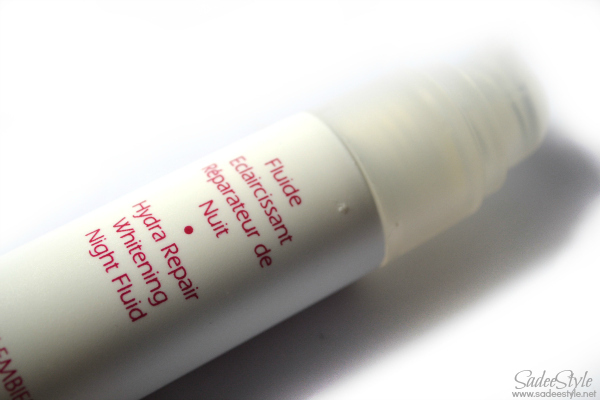 The third and last product is a Hydra Repair Whitening Night Fluid by Nadine Salembier. This cream contains a new and effective active ingredient called Sepiwhite Msh. This ingredientcontrols the overproduction of melanin, the main cause of unsightly pigmentation spots. Nevertheless, Sepiwhite respects the natural Ph of the skin whilst treating this problem. Must be applied in the morning on a perfectly clean skin. 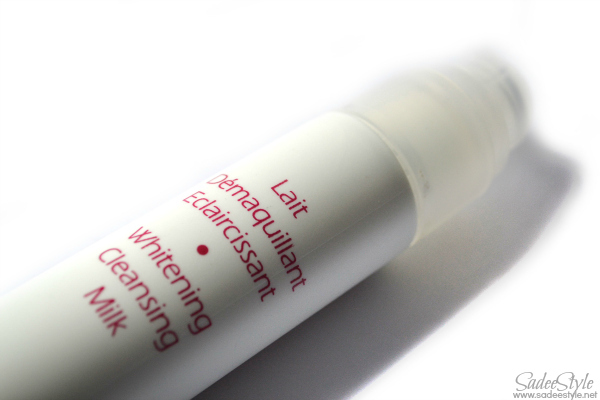 I'm reviewing the Whitening Cleansing Milk first. I was using liz earle cleanser and polish before and was quite satisfied. The only problem with the liz earle was that made my skin a bit more dry. 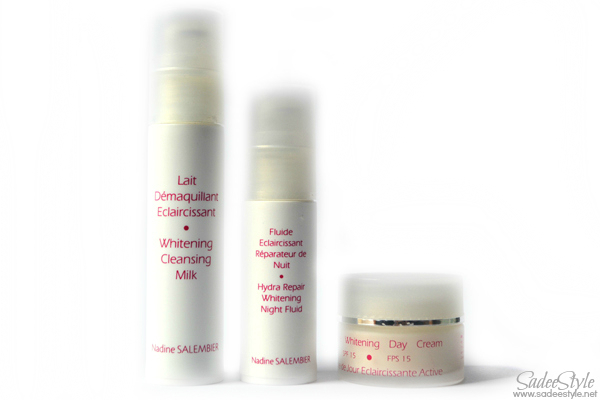 The consistency of the Whitening Cleansing Milk is quite sheer as compared to liz eale one. I hate the annoying smell too. It felt so greasy after the wash. Although it can be a good makeup remover, but I can't stand for bad smell. The second product Hydra Repair Whitening Night Fluid which is quite effective product. I used it for almost 7 days and I can say it worked a little better than the cleanser. I can notice the improvement in my skin, but there is still the same greasy feeling and annoying smell in the product. The last product is Intense Whitening Day Cream - SPF 15. I love the soft and velvety cream which goes smooth on skin and absorb quickly into the skin, but there is a little bit greasy feeling too and I really don't like the smell. Overall, it's an average product for skin lightning. It might work better on you, if you have dry skin, but i wont recommend it if you already have an oily skin. Good product for dark spots on face. Greasy Feeling after the wash. I would only recommend it if you have a dry skin. Nice review, I have very oily skin so I probably would not try this product but thanks for sharing.